Richard Asher ‘JR’ King, III, 56, of Nashville, died March 13, 2019, in Nashville. He was born March 15, 1963, in Lompoc, Calif., to the late Richard and Fannie Hamilton King. He was preceded in death by a sister, Denita King. Survivors include: his wife of 28 years, Loretta King; daughters Dontishia King of Nashville, Chantel Finley of Texarkana, Texas, and Tyana Paxton of Mineral Springs; a sister, Deborah Marshall of Nashville; brothers William King and James Patrick King of Hot Springs, and Donald King of Mineral Springs; also grandchildren. Funeral services will be Saturday, March 23, 2019, at 11 a.m at the Sixth Street Auditorium in Nashville. Burial will follow at Sunset Gardens Cemetery in Nashville. 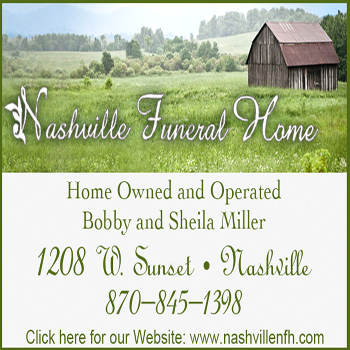 Arrangements by Carrigan Memorial Funeral Services of Hot Springs.